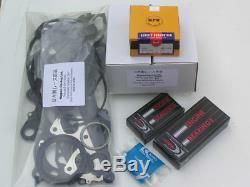 Nippon Racing Full Engine Gasket Kit. High Strength 9310 Steel Wrist Pins. King RACE Rod and Main Bearings. 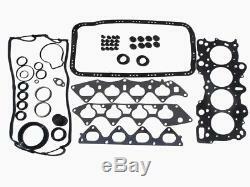 Nippon Racing Engine Gasket Kit Inlucdes the Following Gaskets and Seals. Head Gasket (Nitrite MLS) Exhaust Manifold Gasket (Stainless Steel MLS) Intake Manifold Gaskets (B16A & B18C) Valve Cover Gaskets and Seals Oil Pan Gasket Front Main Seal Rear Main Seal Spark Plug Galley Seals Camshaft Seals Camshaft Plug All O-Rings Exhaust Seals Water Pump Gasket Racing High Tempature Valve Stem Seals (Viton) Oil Strainer Gasket Oil Pump O-Rings This Kit Will Fit The Following Engines. Honda B16A B16B B16A1, B17A, B18A/B, B18C GS-R or B18C5 Type R THESE PISTONS WILL NOT WORK IN B20B AND B20Z MOTORS. ------------------------------------------- These pistons are designed for High Compression All Motor Engines with a Compression ratio of 10.20:1 to 12.64:1 B16A Block and Head 10.95:1 B18A/B Block and Head 11.40:1 B18C1 Block and Head 12.40:1 B18C1 Block and B18c5/B16A Head 12.10:1 B18A/B Block with B18C1 Head 12.64:1 These pistons have Holes in the wrist pin bosses to improve oiling and superior lubrication. Piston skirts are fully coated for added protection aginst heat. Oem honda pistons only have 20 percent of the skirt coated. These pistons are domed to match Honda's B16B piston. 40 Percent stronger than OEM honda cast pistons. Wrist pin center to dome height has been matched to within. 001 Dome displacment has been matched to within. 005 CC This results in near identical cylinder compression, yielding more horsepower and better efficiency. Pistons are Available in STD 81.0mm ONLY! 040 Oversized pistons, Please See our Other Listings. Bearings are Available in STD. 030 When ordering the kit please specify your bearing sizes. Also please list which engine block you are going to be running. Alecular Bearing Material KING developed this alternative to the traditional tri-metal bearings construction. KING bearings have a single deep. 015 layer of Alecular material, an exclusive alloy of aluminum, tin, copper and other metals, on the steel backing. This gives us superior embedability. " Bull's Eye" Bearing Wall Tolerance With advanced quality control procedures, KING is able to maintain rod and main bearing wall thickness tolerances at an amazingly tight plus or minus. 0001 far tighter than other manufacturers. " MaxFlange®" -- A manufacturing principle that lets racers and street engine rebuilders save engines with borderline crankshaft endplay situations without additional machining. Precisely-controlled bearing flange length is the secret. King originated this manufacturing technology. Dont be fooled by cheap imitations. Trust the genuine Nippon Racing brand that is really made in Japan. Cashier's Checks: Cashiers checks will be accepted. Some items due to weight and size can not be combined with others. Package Tracking: All packages come with online tracking. Please understand that in some cases the packages are not scanned immediately by the carrier and the tracking information may not be immediately available on their respective websites. Please check your parts to ensure that what you received is what you ordered before modifying it or installing it. Once the part has been modified or installed, all warranties against defects of material or workmanship are void and the parts are not returnable. 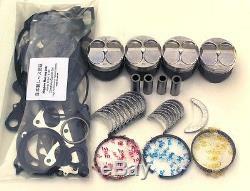 The item "NIPPON RACING JDM CTR CIVIC TYPE R PISTON PISTONS BEARINGS RACE ENGINE KIT 81mm" is in sale since Wednesday, September 10, 2014. This item is in the category "eBay Motors\Parts & Accessories\Car & Truck Parts\Engines & Components\Engine Rebuilding Kits". The seller is "uyunira" and is located in Fontana, California.